Sunday Photo Fiction can be found here. Somewhere in the distance there was the sound of barking, and the smell of smoke. She couldn’t understand what it was, but as she started to wake up, Doris realised that no longer being in the dream should have removed the smell of the smoke as well. Her eyes opened with a start at the sound of renewed barking from outside her bedroom door and the scratching. Throwing a robe around herself, she opened the door and coughed at the smell of smoke. It was not coming from her flat though. Doris ran through her hallway and saw a slight drip coming from the top left corner of her front room ceiling. She felt cold creep over her at the thought of the family living upstairs. Running outside, Doris started yelling “FIRE!” as loud as she could and started banging on the door of the maisonette above her. Looking up, she could see an orange glow flickering in the window. She banged some more, still shouting, and noticed lights in other houses coming on. At 3am, she was glad she could wake someone. The light behind the door came on and she heard muffled shouting, followed less than a minute later by a man and woman running out. The man was holding the hand of a six year old boy, and had a four year old in his arms. The woman had a twenty-two month old daughter in her arms. The dog had just saved five lives. I was the four year old in my father’s arms and the dog, Gyp, received an award for saving our lives in 1971. 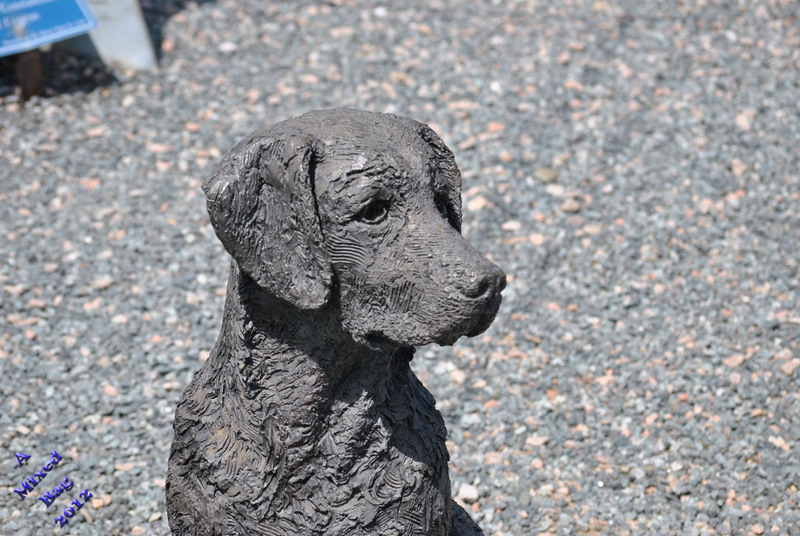 The photo is not Gyp, the photo is Bob, the statue of a dog at the Battle of Britain Memorial in Capel-le-Ferne, Kent, UK. This entry was posted in Photo Fiction and tagged Animals, Dogs, Flash fiction, History, Life, Memories, Online Writing, Sunday Photo Fiction. Bookmark the permalink. WHOA – Glad you lived to tell the tale BroBro! Al, this was flat-out amazing BEFORE I learned it was true. You writing in this one is electric. Thanks John. It is something that I can remember very clearly even 44 years later. She was a fantastic dog. I’m going to go to the library next time I am in the town and grab the news report from then and share it. I will do. Not sure when I can get to the town yet though. But hopefully it will be in the next week or so. I remember you saying something about a fire before but I had no idea. Amazing story, so glad you shared it. Oh my gosh! This is a true story! Thank God that dog was able to save you and your family and Doris. Amazing story Al. Thank you for sharing it with us. Thanks Joy. I’m going to see if I can find the newspaper reports in the library when I get into the town next. Gyp was awesome. I’m not sure what the woman’s name was, we all used to call her “Aunty Dossie”. I remember being carried down the stairs and looking towards the living room door which was glass, and seeing the flames on the other side, then my mum and “Doris” throwing bowls of water at the ceiling to stop the flames and the dripping polystyrene tiles melting. What happened, was the fire place hadn’t been placed properly on the hearth. During the night, an ember flew out and dropped down between the floorboards and slowly heated up until .. .whumpf … As it happened, the day before, my mum had had all of the photos of me as a baby out to show someone. So there is now only one photo of me below the age of four. It was also three days after my brother’s birthday as well, so he lost all his toys, but my mum told me that the neighbours clubbed together to buy him some more. If that’s true, then that is awesome. That’s sad that most of your baby pictures were burned in the fire. It is wonderful that the neighbors all pitched in to replace your brother’s toys that he had received on his birthday! What is truly wonderful is that you all got out of the fire safely and no one was hurt. It could have so easily have gone the other way. I imagine that this is a memory that is “burned” into your memories – how could it not be? Heh I like that 🙂 One of my earliest memories. November 9th 1971 at 3am. We moved from place to place for a little while whilst the flat was being repaired. We were very lucky though. Yes, you were! That’s great you were able to move back to the same flat eventually. We stayed there for almost 10 years. Moved out in June 1981. That’s amazing. You all probably had an almost brand new flat to live in. It just seems to me that your flat was burned and you and your family had to move around until you could move back into it so the flat had to be relatively new after the fire. Thanks Eric. She was amazing. I’m going to have to go to the library and find the news report on her and what she did. It is true 🙂 It’s one of my first memories.I remember my mum and the woman who lived downstairs throwing buckets of water up at the ceiling as the flames were coming through.